Reading and share top 13 famous quotes and sayings about Mandrake by famous authors and people. 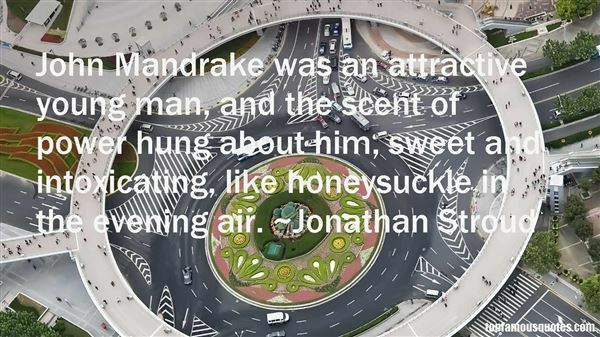 Browse top 13 famous quotes and sayings about Mandrake by most favorite authors. 1. "Monsters' can help us by giving a tangible form to our secret fears. 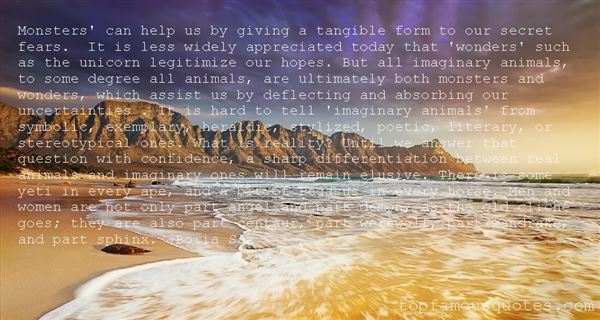 It is less widely appreciated today that ‘wonders' such as the unicorn legitimize our hopes. But all imaginary animals, to some degree all animals, are ultimately both monsters and wonders, which assist us by deflecting and absorbing our uncertainties . It is hard to tell ‘imaginary animals' from symbolic, exemplary, heraldic, stylized, poetic, literary, or stereotypical ones. What is reality? Until we answer that question with confidence, a sharp differentiation between real animals and imaginary ones will remain elusive. There is some yeti in every ape, and a bit of Pegasus in every horse. Men and women are not only part angel and part demon, as the old cliché goes; they are also part centaur, part werewolf, part mandrake, and part sphinx." 2. "So, Mr. Mandrake, what is it you plan to do with me this evening?" I asked haughtily. "I presume," he said, playing along, "that I will start with feeding you proper and then proceed with more…pestiferous acts. "I smiled through the confusion. I'd have to look up that word later." 3. "Soak blanket in gravy and make a delicious brick wrap. Serve in All Gravy Room at the Mandrake Hotel." 4. "Our weaponry was not dropped onto our laps one morning. It is not manna from Sinai's skies. Since Agincourt, the White man has refined & evolved the gunpowder sciences until our modern armies may field muskets by the tens of thousands! Aha!' you will ask, yes, ‘But why us Aryans? Why not the Unipeds of Ur or the Mandrakes of Mauritius?' Because, Preacher, of all the world's races, our love—or rather our rapacity—for treasure, gold, spices & dominion, oh, most of all, sweet dominion, is the keenest, the hungriest, the most unscrupulous! This rapacity yes, powers our Progress; for ends infernal or divine I know not. Nor do you know, sir. Nor do I overly care. I feel only gratitude that my Maker cast me on the winning side." 5. "In a painful time of my life I went often to a wooded hillside where May apples grew by the hundreds, and I thought the sourness of their fruit had a symbolism for me. Instead, I was to find both love and happiness soon thereafter. So to me [the May apple] is the mandrake, the love symbol, of the old dealers in plant restoratives." 6. 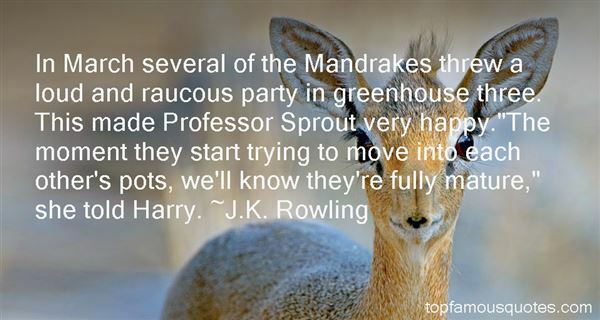 "In March several of the Mandrakes threw a loud and raucous party in greenhouse three. This made Professor Sprout very happy. "The moment they start trying to move into each other's pots, we'll know they're fully mature," she told Harry." 7. "There had been no more attacks since those on Justin and Nearly Headless Nick, and Madam Pomfrey was pleased to report that the Mandrakes were becoming moody and secretive, meaning that they were fast leaving childhood." 8. "Go and catch a falling star,Get with child a mandrake root,Tell me where all past years are,Or who cleft the devil's foot,Teach me to hear mermaids singing,Or to keep off envy's stinging,And findWhat windServes to advance an honest mind.If thou be'st born to strange sights,Things invisible to see,Ride ten thousand days and nights,Till age snow white hairs on thee,Thou, when thou return'st, wilt tell me,All strange wonders that befell thee,And swear,No whereLives a woman true and fair." 9. "And sure enough,the youth in question was not his usual dapper self. His face was puffy, his eyes red and wild; his shirt(distressingly unbuttoned)hung over his trousers in sloppy fashion. All very out of charactar: Mandrake was normally defined by his rigid self-control. Somthing seemed to have stripped all that away.Well, the poor lad was emotionally brittle.He needed sympathetic handling. "You're a mess," I sneered "You've lost it big time. What's happened? All the guilt and self-loathing suddenly get to you? It can't just be that someone else called me, surly?" 10. "John Mandrake was an attractive young man, and the scent of power hung about him, sweet and intoxicating, like honeysuckle in the evening air." 11. "They were proclaiming the end of the world, redemption through penitence, the visions of the seventh day, the advent of the angel, cosmic collisions, the death of the sun, the tribal spirit, the sap of the mandrake, tiger ointment, the virtue of the sign, the discipline of the wind, the perfume of the moon, the revindication of darkness, the power of exorcism, the sign of the heel, the crucifixion of the rose, the purity of the lymph, the blood of the black cat, the sleep of the shadow, the rising of the seas, the logic of anthropophagy, painless castration, divine tattoos, voluntary blindness, convex thoughts, or concave, or horizontal or vertical, or sloping, or concentrated, or dispersed, or fleetin, the weakening of the vocal cords, the death of the word. Here, nobody is speaking of organisation." 12. "Merewyn was a little more rational. "Perhaps we should whisper amongst ourselves and make them wonder what we speak of?" Blaise wagged his eyebrows at her before he pulled her into his arms. "Works well for me. Put your arms around my neck, and I'll breathe in your ear." Varian put the blade of his sword between them. "You can whisper from there." Blaise appeared appalled. "What are you? An old maid?" "I promised her my protection." The mandrake shook his head. "You're gay, aren't you?" Varian raised the blade to rest against Blaise's Adam's apple. He carefully pressed it close. Not so much that it drew blood, but enough to let him know that he wasn't amused. "Or not." Varian used the blade to push him away from Merewyn. His gaze met hers, and he felt the heat of his desire for her all the way through his body. At the moment, he wished he were gay. Then she wouldn't tempt him so. "Or not. Definitely or not." 13. "Devil's WishA bowl of spellsSwirls a mixSmoke and bubblesSeek the fixYoung boy's eyeAnd fever fewWitches grassSome mandrake root"
Sometimes they are a matter of luck; the photographer could not expect or hope for them. Sometimes they are a matter of patience, waiting for an effect to be repeated that he has seen and lost or for one that he anticipates."